On 25th and 27th of February, Cairo is witnessing an event that aims to offer businesses new horizons to grow. 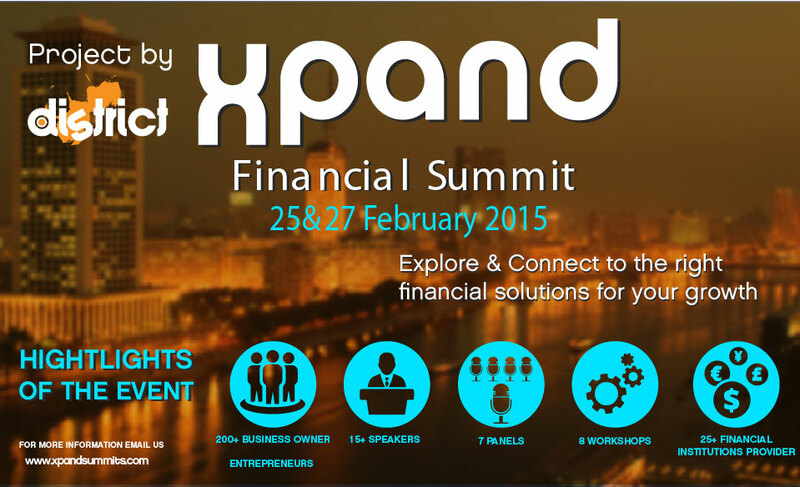 Xpand Financial will bring together more than 200 businesses and financial solution providers in a two-day premium business event that offers hands-on practical financial solutions for scaling up small and medium enterprises (SMEs). The event will take place at Cairo Convention Centre featuring a line- up of top speakers and match-making modules. Xpand is siding Egypt’s biggest economic summit that will be held in Sharm El-Sheikh from 13 to 15 March under the title ‘Egypt is the Future’ to capitalize on the momentum created by the economic summit and reflecting it on the SMEs sector. “The main goal behind Xpand is to shed the light on SMEs in Egypt, the sector that marks up for more than 90 percent of the Egyptian economy, we wanted to use the economic summit as a moment to activate and create real opportunity for business, investors, and financial institutions to meet, interact and grow their business in a dynamic set-up” said Mazen Helmy, founder and CEO of the District, Egypt’s first co-working space and organizer of Xpand. Xpand is expected to be a platform to fast-track businesses with a dynamic environment where interactions, knowledge, and best practices of finance happens, attracting banks, VCs, Investors, Private Equity, leasing and factoring companies together with SMEs owners and C-Suite executives. The Summit is designed to take the entrepreneurs in a journey of boarder 360 bird view panels mapping out the Egyptian market and the financial trends to be followed by more focused approach to deepen the understanding and present a live case study discussion through workshops to end with Xpand’s main goals of kicking off a match-making between different business and financial. Both public and private institutions point of views are bridged at the event, as Xpand happens in partnership with key players in financial world such as Bedaya Centre for Entrepreneurship and SMEs development of General Authority of Free Zones & Investment (GAFI), the Egyptian Banking Institute (the training arm of the central bank), NILEX (Egypt’s SMEs stock market), Egyptian Private Equity Association, Endeavor Egypt, Cairo Angels, Egyptian Junior Businessmen Association, 138 Pyramids, EJB, and main partner MC Egypt. Scheduled speakers include vice president of the World Association for SMEs Dr Khaled Nagaty, general manager of GroFin Egypt Ahmed Gomaa, manager for the SME sector at the National Bank of Egypt (EBI) Mohsen Ismail Abou-Bakr, Cairo Angels founder Hossam Allam, Mr. Hesham Wahby Co-Founder and CEO of Innoventures, Mr. Tarek Assaad, managing partner at Ideavelopers, Mr. Omar Askar, Bedaya Fund manager, and District founder Mazen Helmy along of top names in finance and entrepreneurship. “The event is the perfect opportunity for businesses that aspire to scale-up, either access new markets, improve infrastructure, or grow in operation. Our target is entrepreneurs who have steady current operation and looking to expand their business,” said Raghda El Halawany, Xpand’s Project Manager. For the past four years, since its inauguration in 2010, The District Egypt was the first professional co-working space in Egypt and one of the biggest in the region. It has helped giving birth to a new working lifestyle and industry in Egypt and the region forever. Leading the co-working scene, The District Egypt had inspired and opened the door for dozens of more co-working spaces to open gradually, accelerating the growth of the industry itself in the region and increasing dramatically the awareness and likeability of the public toward the co-working as a concept. The District Egypt has received massive global attention and recognition, being featured in many global media publications and high-profile events which gave a boost not only to The District as a leading brand but to the whole market.